Located in the north of Iran on the slope of the Alborz Mountain, Tehran is the capital of Iran and its largest city, covering an area of 1500 sq. km. The average altitude of Tehran is 1200m, with 700m altitude difference between its lowest and highest points. The wealthier neighbourhoods of Tehran are located in the north at a higher altitude. The history of Tehran dates back to 6000 BC, when the first settlements were established in the area. Over the centuries Tehran used to be a smaller city and only started gaining prominence in 1795 when it was made the capital of Iran by the Qajar king Agha Mohammad Khan. Most old buildings were destroyed in the 1950's and 60's by under the rule of Mohammad Reza Shah, who had them replaced by modern buildings. As a consequence Tehran nowadays is a relatively unattractive city, which despite its 8000 years of history lacks a historic core. From a tourist perspective Tehran is a huge city with quite modern buildings. 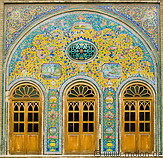 The climate in Tehran is continental, with hot summers and cold winters.